He seemed like a mensch. I wish I could tell you more about him, but I only met him five days ago. Dana Brand was a professor at Hofstra University, an avid Mets fan and blogger, an author of two books on the Mets, a husband and father. 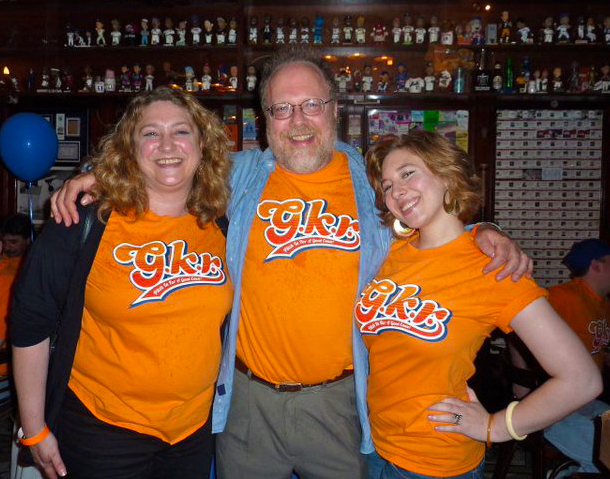 In the relatively small subset of Mets fans that is the blogging community, he was a collaborator with and supporter of many and a mentor to all. As much as I loved reading his writing, it was even more of a delight to speak with him face to face on Saturday night. My family and I, along with dozens of other Mets fans, were at Foley’s Sports Bar in Manhattan Saturday night for a charity event sponsored by the foundation of SNY-TV announcers Gary Cohen, Keith Hernandez, and Ron Darling. As much fun as it was to see the likes of Cohen and Darling tending bar and having them each pour a drink for me, the true highlight of the evening for me was the fact that I left that intimate gathering of like-minded people feeling that I had made a new friend: having recognized Dana from photos on his blog, I tentatively introduced myself. I needn’t have shown such temerity: he enthusiastically greeted me by name and told me how much he enjoyed reading my blog posts–a real compliment coming from someone with his literary credentials! After introducing him to my family, the four of us talked about everything from the special relationships that can develop between fathers and daughters, the operas he had seen at the MET, as well as my daughter’s experiences in the MET Children’s Chorus. Clearly, he was interested in getting to know us better personally. When the subject did turn to the Mets, he excitedly told us of a special event he was planning in celebration of the fiftieth anniversary of the Mets franchise to be held at Hofstra University. Dana seemed just as interested in sharing mutual remembrances of Mets history brought up by my husband Garry–a Mets fan from the team’s beginning and of Dana’s same generation. Garry enjoyed having the opportunity to tell Dana personally how much he had enjoyed reading both of his books. It was with obvious pride that Dana later introduced us to his lively, charming daughter and sister. As much passion and zeal as he obviously had for his team, it was very clear what a devoted and proud father he was as well. Before we left Foley’s that night, we exchanged contact info with Dana, promising to meet up at Citi Field at a game in the near future. It truly felt like we had met a real kindred spirit, and all of us agreed that we were so glad that we had made his acquaintance. Dana passed away suddenly yesterday afternoon. I learned this early this afternoon through a Mets blog. Within a matter of hours, the sad news passed through the Twitter community and has resulted in countless other blog posts in honor of Dana. Word had obviously made its way to the SNY TV booth at Wrigley Field in Chicago as, watching this afternoon’s game on TV, we heard Gary Cohen make a brief tribute, mentioning Dana’s passing and what a devoted fan, blogger, and author he was. In reading these blog posts, it is clear to me that I missed a real opportunity not having made Dana’s acquaintance sooner. He was obviously a person who had been a positive influence in many, many lives. My family and I wish to add our condolences to Dana’s family and friends.